We’re excited to connect with our AWS Partner Network (APN) Partners from around the globe at AWS re:Invent 2017. To help you plan ahead, we’ve rounded up a number of things to check out while you are in Las Vegas. The AWS Global Partner Summit is taking over the MGM Grand on November 27 and 28 for two days of partner-focused content, including the keynote and breakout sessions. 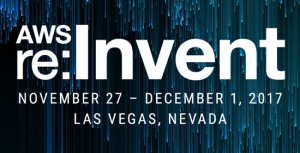 Check out the re:Invent website to learn more about our extended campus and shuttle schedule. Kick off your week and join us Monday evening from 6-8 p.m. at Hakkasan Nightclub and Restaurant. Enjoy drinks and appetizers while you mingle with the AWS team and other APN Partners. Join us Tuesday morning at 9 a.m. in the MGM Grand Garden Arena for the keynote presentation, emceed by Terry Wise, Vice President, Global Alliances, Ecosystem and Channels. You’ll learn about cloud-powered innovation and the business opportunities it creates for APN Partners. Working the Expo Hall Tuesday morning? We’ve got you covered—Terry’s keynote will be live streamed into the Expo Hall until doors open to the public. With an additional half-day of content and 50% more sessions than last year, there are lots of opportunities to attend sessions tailored to your specific needs. Reserve your seat before you go through the online session catalog. Questions about the AWS Partner Network? Stop by our APN Partner Kiosk at the Global Partner Summit or in the Venetian Expo Hall to meet our team. Learn how to differentiate your offering in the APN, integrate your solution with AWS, leverage APN go-to-market opportunities, and much more! Located in front of the Venetian Expo Hall, visit the AWS Competency and APN Partner Program Alcove to meet with our APN Program and Partner Development Teams and learn about partner programs that technically validate your solution. We can’t wait to see all of you at AWS re:Invent 2017. In addition to the event website, you can watch videos on the AWS re:Invent 2017 YouTube playlist and learn about our expanded campus, breakout sessions, reserved seating, and more. Unable to attend in person? Join us from the comfort of your home or office and register for the re:Invent live stream.